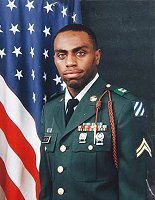 Spotlight On: Joseph A. Dugan, Jr. Hall of Valor | Soldiers & Sailors Memorial Hall & Museum Trust, Inc.
Staff Sergeant Stevon A. Booker, Apollo, PA, was killed in action on April 5, 2003 and in recognition of his gallantry that day he posthumously received the Silver Star Medal. Fellow soldiers who fought with him felt his actions went above and beyond the Silver Star Medal. In 2019 Staff Sgt. Booker’s Silver Star Medal was upgraded to the Distinguished Service Cross. On the anniversary of Staff Sgt. Booker’s death, the US Army presented the Distinguished Service Cross to his family in a ceremony held here at Soldiers & Sailors. On the same day, Soldiers & Sailors was proud to unveil a new plaque in recognition of the upgraded medal. Please visit Soldiers & Sailors beginning on April 11th through the end of the month to view the new plaque on display in our Hall of Valor marking the presentation of Staff Sgt. Booker’s Distinguished Service Cross. Also available for viewing are the nine new members of the Hall of Valor who were inducted on March 31, 2019. Stop by Soldiers & Sailors during the month of April and “Honor Them with Your Presence”.